Over three weeks this July and August, Archaeovision completed one of our largest recording projects to date, on behalf of the University of Lancaster’s Digital Humanities Hub and Manx National Heritage. 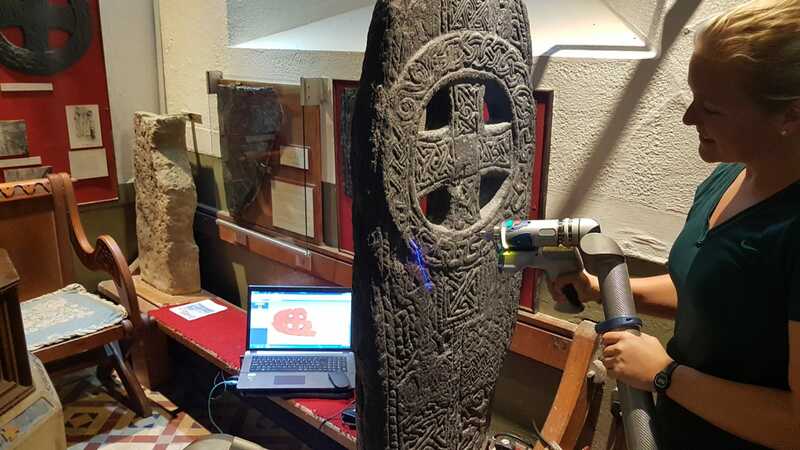 The project, to laser scan all Early Medieval stone crosses found on the Isle of Man (205 of them), used blue-light laser light scanning technology employing a FARO Edge Arm Scanner with a REV6 HD Laser Line Probe (LLP) attachment. This particular set-up allows for an extremely high resolution product: the accuracy of the scanning system is ±25 microns (μm) and is incomparable to other recording solutions. The Manx Crosses are stone objects of extraordinary diversity and cultural interest found throughout the Isle of Man. They range from simple grave markers to elaborately decorated and inscribed monuments. The stones were carved during a pivotal time, stretching from the Island’s introduction and conversion to Christianity in the 5th and 6th centuries, through to the reorganisation of the church in the 12th and 13th centuries. Some of the stones are carved with letters of the Ogham, Runic and Latin alphabets, while others include personal and place names and scenes from Christian and Norse mythology. About a third of the crosses are publicly displayed in two cross shelters located at Kirk Maughold and Old Lonan Church in their respective parishes. Another third are allocated their own spaces in several churches throughout the Isle. The last third of the crosses are located within the Manx Museum, either on display in the galleries or within the stores or archives. The results of the recording will provide an electronic corpus for the Manx Crosses to Manx National Heritage, creating a benchmark for conservation from which to measure degrees of deterioration of the stone material in the future. All of the data captured will be made publicly available, allowing those interested to view and manipulate the 3D models online. The next steps in the project are to process the raw point cloud data and create full resolution textured meshes. We look forward to the ongoing work!